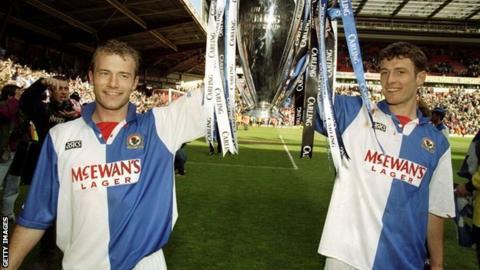 Blackburn Rovers's Premier League title triumph was a "Cinderella story" that will never be repeated, according to their former manager Kenny Dalglish. Rovers became the only town club to win the Premier League 20 years ago today, helped by owner and Blackburn steel merchant Jack Walker. "I don't know if anyone else could go on and do it," then boss Dalglish told BBC Radio 5 live. "I would doubt it. "It was a Cinderella story. It is romantic." The east Lancashire town, with a population of a little more than 100,000, had a club in football's second tier when Walker took over and appointed former Liverpool boss Dalglish. They immediately won promotion to the Premier League, via the 1992 play-offs, to end 26 years out of the top flight before winning the title just three years later. "No-one could do it so quickly again," Dalglish told BBC Radio 5 live's 'Joy of the Rovers show', which will be aired on Thursday, 14 May at 19:30 BST and the same time on Sunday, 17 May. "It would have to be a long time from start to finish if they were ever going to do it. It is one team who has been fantastically successful and won the biggest trophy in this country - the Premier League. "For every romantic one there are about 20 who are going out of business. You can understand the financial fair play rules but if they had been in place it would never have happened for us." Walker's money helped Rovers twice break the British transfer record for strikers Alan Shearer and Chris Sutton, for £3.4m and £5m from Southampton and Norwich respectively, and sign Tim Flowers in a £2.4m record deal for a goalkeeper. On a dramatic final day in May 1995, Blackburn won the title at Anfield despite losing 2-1 to Liverpool. Dalglish's side finished one point ahead of Manchester United, who could only draw 1-1 at West Ham. Now, with the Premier League's Financial Fair Play regulations stopping clubs from losing a certain amount of money a season, Shearer has ruled out a repeat of Rovers's remarkable rise. "For a team the size of Blackburn it is now impossible," said Shearer, who scored 131 goals in four seasons at Ewood Park. "Whoever you are, you need the finances to try and challenge. The dream has gone for a vast majority of clubs. "No-one can do what Jack did, be born and bred in that town, want that football club to have a good time and to try and entertain the fans. It is not allowed." Alan Shearer tweeted this picture on Thursday with the caption: "Some have aged better than others...."
You can listen to 'Joy of the Rovers' - a celebration of Blackburn's title-winning triumph 20 years ago - on Thursday, 14 May at 19:30 BST and the same time on Sunday, 17 May. It includes Alan Shearer revealing Manchester United were interested in signing him before Blackburn, Dalglish, Shearer and Chris Sutton discussing the formula behind the title triumph, plus plenty more.